Burger King’s advertisements in Singapore occasionally feature slightly naughty images and suggestive schoolboy-humour taglines. The website of the waxing company ‘Strip’, which attends to the intimate grooming needs of Singapore's hairy women, and men, also includes a few bush jokes here and there. 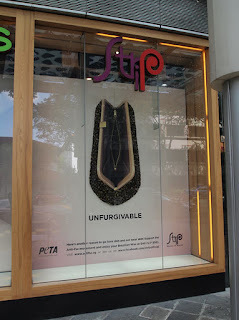 The anti-fur campaign advertisement in the shop window of the Raffles City branch doesn't beat around the bush (arf).